Diegos Umbrella and Warped Tour Recap! Huzzah to all our warped and wonderful friends!!! First off, if you’re new to our mailing list, WELCOME!!! You have entered the strange, and absolutely ridiculous world of the Velveteen Band. 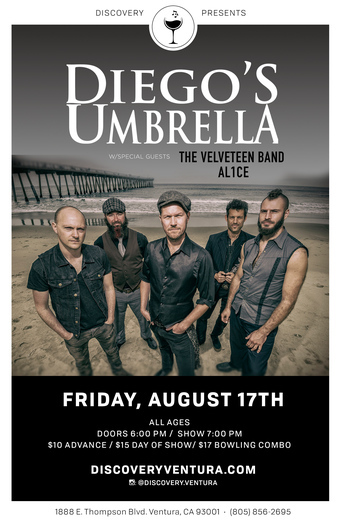 And even though we’re still recovering from our Warped Tour sunburns, we thought it was important to remind you about a HUUUUUGE show coming up on August 17th with gypsy rock ambassadors, DIEGO’S UMBRELLA! Los Angeles moon rockers, Al1ce will be opening the show, and pre-sale tickets are only $10!!! ($15 at the door) Click here to get them now! And just one more thing…WARPED TOUR WAS INCREDIBLE!!! How awesome was it? Well, find out in this neat recap video Jason made! It was an absolute dream come true to participate in the last Warped Tour EVER! A tour we used to attend growing up, it was an honor indeed! 2018 began with a show at Gallifrey One, and has just kept getting more insane from there! We are working on some really big things later on this year, so keep connected to us on our Facebook and Instagram and You Tube Page, for updates, and general silliness. THANK YOU for supporting our madness!!! Previous PostVans Warped Tour, here we come!! !Next PostOxnard Steampunk Fest, October 13th!!! Ooops! Our show is on the 17th! Thanks John!